Using crutches can be a pain. Besides any physical pain, they’re inconvenient because while you’re moving, your hands are always full. 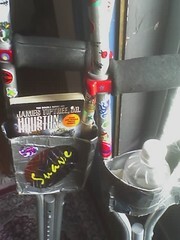 Around 10 years ago I made these crutch pockets to hold a book, kleenex, and a travel mug of coffee. It was non-trivial to crutch from room to room or out to the porch and back, so it came in super handy to have extra pockets built in. The pockets are made of videotape boxes cut in half and spliced together. I used videotape boxes because that’s what I had handy. They aren’t necessary: you could make the whole thing out of just plain duct tape. However, thin boxes provide a shape and a substrate. To make pockets for your crutches, tape across a nice-sized box, straight around the crutch frame. Taping on a diagonal keeps the pockets stable. These are taped about 6 inches below the handholds, just above the fork. Saddlebags for each crutch might work, but I don’t like anything bumping my legs or knees while I’m crutching around. The stickers make everything more cheerful, but I could imagine a really nice decoupage project that has more artistic unity! Old people sometimes seem to learn about putting pockets on everything or carrying bags that don’t have zippers or clasps (in case of arthritis) but not everyone thinks of using the real estate on crutches and walkers. So if you know an older person or someone on crutches do them a favor and explain this cheap, nearly effortless, modification! Moomin helped me to refresh the stickers. He’s a little spooked but he’s seen me on crutches before. Not for any length of time since he was a toddler, really. It used to kill me to hear him refer to “mama crutch” in his tiny baby voice, I’d get all maudlin… So, I’m okay, in intermittent nasty pain from the sciatica, pissed that I’m having problems, but feeling philosophical. The main problem is putting weight on my leg or moving it forward. Today I got to the point where it made more sense to crutch than to limp, so here I am attempting to make the best of it! Gawd, that is the coolest thing EVER right there! That's a GREAT idea! Damn, wish I'd thought of this last week, when I was still on crutches. Wishing you speedy healing and much help in the meantime. You just made my day. I broke my leg yesterday and I'm already fed up with not being able to carry stuff. Thanks for the idea !! Lifehacker reposted their link here, just in time for my turn on the crutches from a broken ankle. Thing is, to me, any extra wait on the crutches makes them more difficult to maneuver with. I've managed to carry a book in a couple of fingers while crutching about, or holding a water bottle in my teeth. But it's still a great idea for people who don't the extra weight. And I'm all for hacking something to make it more useful! Love it!! What a great idea. Before the invention of internet students gather information and study data through books and libraries. They have the limited resources to collect them. But after internet they can fetch their study data in no time. This is really a nice idea and inspire lots of people to make changes in their crutches. When you are not 100% fit then this is significant to make such kind of changes that will motivate you and also other. Really the internet is a great boon to the world with the help of the internet all the students are able to gather the knowledge without any interruption and delay. Penyakit Stroke ialah jenis penyakit pembuluh darah pada didalam otak manusia. Banyak hal yang jadi penyebab terjadinya kekacauan dalam pembuluh darah pada otak, diantaranya karna adanya penyumbatan pembuluh darah, mengakibatkan pasokan darah sedikit dan mengakibatkan musnahnya sel-sel saraf didalam otak. Penyakit Stroke adalah penyebab kematian terbanyak no.3 di Negara Amerika dan banyak negara industri lainnya. Essay writing services is one of the very use ful one. Thank you for sharing! I liked these idea. Toko Herbal Veherba Sebagai salah satu distributor minuman kesehatan Veherba terbesar & terpercaya, kami melayani penjualan obat tradisional Veherba plus via online maupun belanja langsung di tempat kami. Pengiriman menggunakan jasa jasa luar jakarta kami buka sampai dengan pukul 21.00 WIB setiap hari. Pelayanan kami buka 24 jam Non Stop, guna melayani pelanggan Veherba yang langsung datang ke tempat kami. Ini adalah bukti kesungguhan kami kepada para pelanggan yang memerlukan produk secepatnya. Hi there.I am sure that it's a helpful article.By the way I would recomend you essay writing service to make your life easier. Yeah, that's catchy and also useful stuff! obat kanker payudara Apa anda mengerti arti dari Penyakit Kanker Payudara? Kanker payudara adalah kanker yang terjadi pada jaringan payudara wanita, atau kebahayaan yang diawali dari sel-sel di dalam payudara wanita. Kanker payudara kebanyakan dialami oleh kaum perempuan, namun demikian bisa jugasakit payudara terjangkit juga pada kaum pria. This post is really helpful to know the proper usage of crutch pockets and you can easily know the way how to make such crutch pockets. This kind of posts will be more helpful to the people like me. Keep sharing! Obat Herbal Kanker Payudara amazon Plus merupakan obat kanker payudara yang terbuat dari ekstrak kulit buah manggis yang didalamnya mengandung xanthones ( anti oksidan yang sanggup membantu meyembuhkan berbagai jenis penyakit ) diantaranya membantu menyembuhkan kanker payudara. I used videotape boxes because that’s what I had handy. They aren’t necessary: you could make the whole thing out of just plain duct tape. It is very interesting information. I got to know a lot of new interesting things. Thanks for nice article. More information you can find in our web-site. Choosing a best coffee brewer suitable for your need is sometimes not an easy task. You will find many coffee machine reviews in this website, Including not only big brands such as Cuisinart, Keurig, BUNN, Hamilton Beach, which are always famous for best rated coffee maker products,and also some others , like, Black&Decker, Mr.Coffee, etc.